We all know by now that the Wii edition of Resident Evil 4 will include the Ada side quest from the PS2 version of the game. This however led to many people thinking that the entire Wii version was going to be based on the PS2 version. Since it is now confirmed from Capcom that this is not the case, what I'm doing now is showing you why this is so important that it is the Cube version that the game is based on. When you compare both versions together, there is no contest which version is the best. 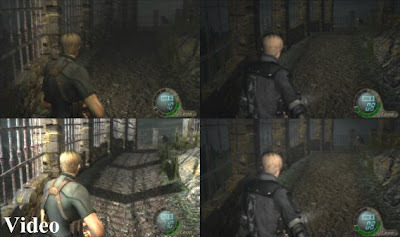 The PS2 version lacks many things that gave Resident Evil 4 on Gamecube atmosphere and detail. The lighting, shadows, polygons and color are all very subdued on the PS2 version. If Capcom chose to just use the PS2 version of this game, I think we would all be extremely upset at the big downgrade from the Gamecube version seeing that the Wii can run all Gamecube games without any problem. Take a look at the links above to see my point for yourself. Let me know what you think.